The advantage of this methods of testing is the ability to help establish the weld’s internal integrity without destroying the welded component. 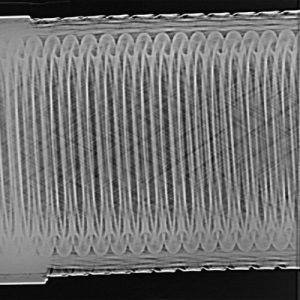 This is achieved by penetrating radiation through a solid object, in this case a weld onto a photographic film, resulting in an image of the object’s internal structure being deposited on the film. The amount of energy absorbed by the object depends on its thickness and density. Energy not absorbed by the object will cause exposure of the radiographic film. These areas will be dark when the film is developed. Areas of the film exposed to less energy remain lighter. Therefore, areas of the object where the thickness has been changed by discontinuities, such as porosity or cracks, will appear as dark outlines on the film. Inclusions of low density, such as slag, will appear as dark areas on the film while inclusions of high density, such as tungsten, will appear as light areas. All discontinuities are detected by viewing shape and variation in density of the processed film.